Lately I’ve been branching out a bit in my review shoe choices in order to get a better feel for the differences among the various types of shoes that exist in today’s footwear market. A few weeks ago I reviewed the Hoka Clifton (the Hoka Huaka worked out a bit better), a lightweight yet super-cushy shoe, and found that the ride didn’t quite work for my stride. It wasn’t so much the stack height as it was the overall softness of the midsole. And back in June I reviewed the Nike Pegasus 31, a fairly traditional neutral trainer, and actually liked them quite a bit. 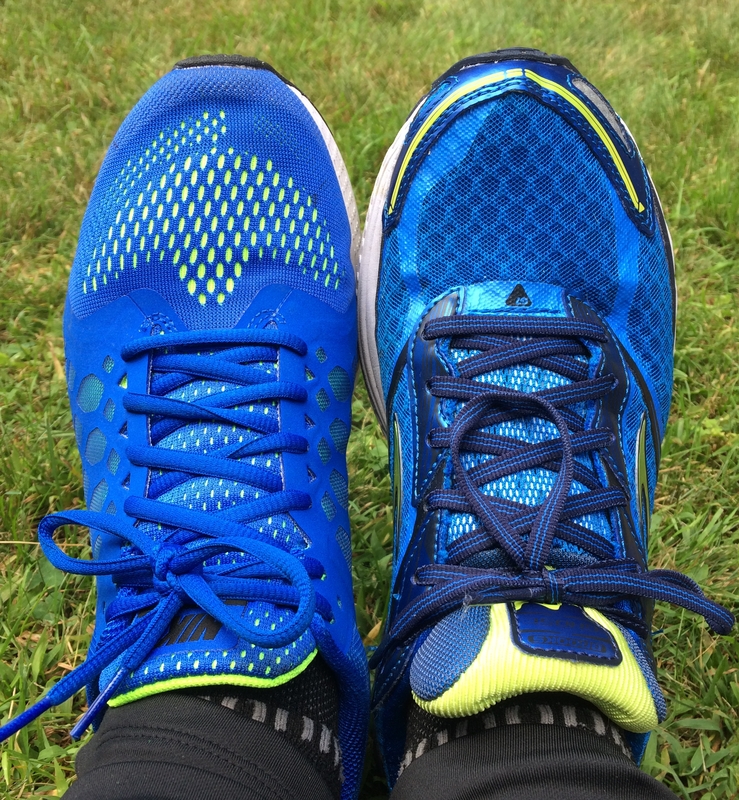 The stack heights are similar when comparing the Pegasus 31 (29mm heel, 19mm forefoot) to the Hoka Clifton (29mm heel, 23mm forefoot), but I preferred the less mushy ride of the Peg. Given my positive experience with the Pegasus, I was interested in trying another traditional neutral shoe to see how it might compare. Brooks was kind enough the send a pair of the Brooks Ghost 7 (Disclosure: these were media samples provided free of charge by Brooks), and I’ve gotten enough miles on them now to share some thoughts. Let’s start with the specs. The Ghost 7 weighs in at just over 10 ounces in men’s size 9, and stack heights are 28mm heel, 17mm forefoot (data via Running Warehouse). The latter are pretty much in line with the stacks reported above for the Nike Pegasus 31 and the Hoka Clifton. What’s interesting to me is that standing in the Ghost, it doesn’t feel like a 10+mm drop shoe. It may be that my heel sinks into the midsole a bit, or maybe my tolerance has just changed with time, but I don’t tend to be bothered by a higher drop shoe these days unless the heel is very firm. The Ghost has a fairly substantial mesh upper with extensive welded overlays. Breathability is adequate, and I have not encountered any hot spots or points of abrasion. The heel counter is fairly rigid, but the interior of the heel counter is well padded and covered by a soft material the feels quite comfortable against the foot. There’s more structure in the heel region than I’m typically used to as a more minimal-leaning runner, but I haven’t had any problems with it. The tongue of the Ghost 7 is well padded and I have not felt any pressure from the laces as a result. There’s also a cool little loop near the top of the tongue that the lace on one side slides through – seems to do a good job holding the tongue in place and preventing slippage (you can see this loop in the image below – it has the alternating white/black band down the middle). The fit of the Ghost is near perfect on me in my usual size 10. I have a full thumb’s width between my big toe and the tip of the shoe, so if anything they run a bit on the larger side. The forefoot is fairly wide and provides plenty of room for my toes to move around. It feels distinctly wider than the forefoot of the Nike Pegasus 31 (see image below – Peg on the left, Ghost on the right), though the latter has a stretchier upper. Fit through the heel and midfoot are comfortably snug, and the laces provide a good lockdown. As with the Hoka Clifton and Nike Pegasus 31, the Brooks Ghost has more sole than I typically like in a running shoe (28mm heel, 17mm forefoot), but I don’t feel like it’s a mis-match for my stride like the Clifton was. 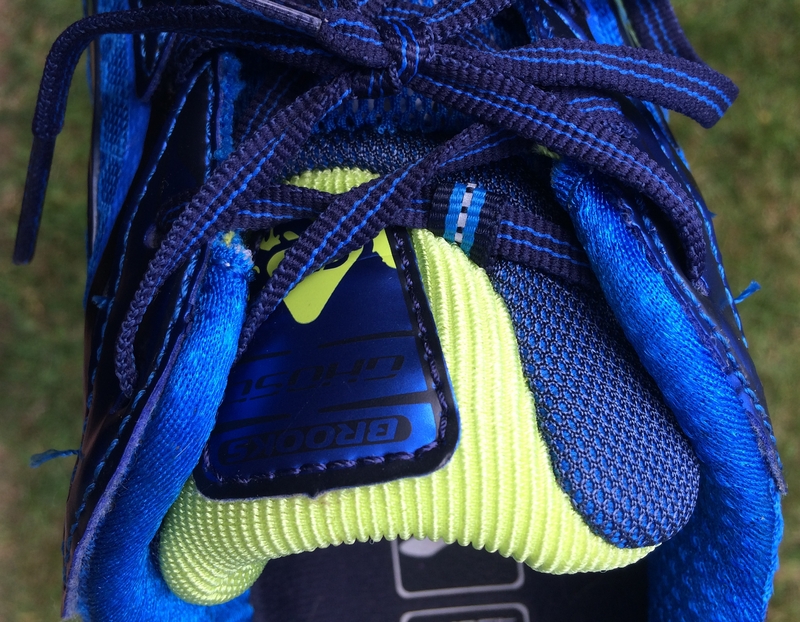 I’ve actually enjoyed running in them, and I’d compare the Ghost quite closely to the ride of the Peg – the heel is fairly soft (though the heel of the Ghost feels springy compared to the slightly mushier heel of the Peg), and the forefoot is firm and responsive. I have not run in previous versions of the Ghost, but apparently one of the changes in v7 is removal of the Brooks DNA inserts – instead the sole is a springy feeling BioMoGo-DNA blend. Feels similar to some of the Brooks Pureproject shoes I’ve run in. I think the cutout area in the center of the heel also contributes to the springy feel, and perhaps to the sensation that the shoe is lower drop than 10mm – my suspicion is that this area compresses downward while you stand in the shoe. Flexibility is decent given the thickness of the sole, but this is no Nike Free. I’ve run over a range of paces in the Ghost and though it doesn’t compare to a racing flat, it has a decent level of responsiveness for a traditional neutral training shoe. However, for most people the Ghost will be best suited as a daily trainer or marathon shoe. I haven’t run in many other shoes in this category so it’s hard for me to compare it to shoes like the Saucony Ride or Mizuno Wave Rider for example, but I’d not hesitate to recommend the Ghost if you’re looking for a traditional neutral shoe with plenty of cushioning. One possible area of concern with the Ghost 7 is outsole durability. There’s quite a lot of rubber outsole on the bottom of this shoe, but the little square nubs along the outer margin seem to wear quickly if they experience a lot of abrasion. I recently met another runner who had sheared a bunch of them off under the outer forefoot without too many miles on the shoe, and I’m seeing some shearing on the nubs along the side of the heel. Anyone else have comments on outsole durability in the Ghost? I’ve been enjoying experimenting with footwear a bit outside my normal range of preference as it allows me to get a sense of how shoes in various categories differ from one another. The Brooks Ghost 7 is a fairly typical neutral training shoe providing ample cushion, a roomy fit, and reasonable flex for a shoe with a fairly substantial sole. I like the springiness of the cushion under the heel, and the firmer, more responsive forefoot. The closest comparison I can make among shoes I have tried recently is to the Nike Pegasus 31, with the Ghost providing a roomier fit up front and springier cushioning in the heel. The Hoka Clifton is similar in stack but lighter and lower drop, so not quite in the same category. It offers a much softer ride that doesn’t work as well with my stride. Though I personally prefer a bit less shoe, if you’re looking for a neutral shoe to eat up miles and possibly use for long races, the Brooks Ghost 7 is worth a look. 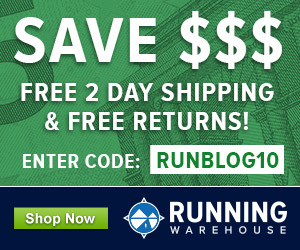 The Brooks Ghost 7 is available for purchase at Running Warehouse, Zappos, and Amazon.com (or your local running specialty store). 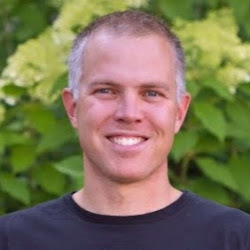 Purchases made via these links provide a small commission to Runblogger and help to support the production of reviews like this one – thanks! Thanks for a great review! I’m the happy owner of a couple of Brooks Ghost 7 shoes. I’ve used them for a couple of months now and I also see a some shearing on the small square nubs under the outher forefoot. My son’s Ravenna4 have the same wear issue, the outer lugs have disappeared in less than 100 miles. I hope Brooks goes back to tougher rubber, even if it adds some wgt. As a 135-pound runner wearing Ghost 6 (which have very similar outsole design), I’ve hardly seen any wear on the outsole after 280 miles run mostly on pavement. The Ghost 6 and Ghost 7 outsole lugs have a similar shape, but they are larger on the Ghost 7 (part of Brooks’ aim to make the shoe more responsive) and thus fewer in number. I find that with the fewer lugs, the most lateral lugs take on even more shearing force. I feel that this is just one of those few shoes in which the outsole will wear out before the midsole breaks down. I’ve had three generations of the ghost now (up to v.6, not tried 7 yet), and find they hold up to 500+ miles without a problem. The nubs do wear more quickly than that, but it’s never been a problem for me. (I will say that wear for me on most shoes is right down the middle, not on the outer edge). Cushioning is perfect for someone like me who has trouble with more minimal shoes, but doesn’t need all the added motion control of an adrenaline, etc. The poor outsole durability is the Achelle’s heel of Brooks. That outsole wear out faster than any other competitor. I’ve already met 3 pairs of this shoe out of 3 (2 on the web, and I own the third one) with the same manufacturing problem. 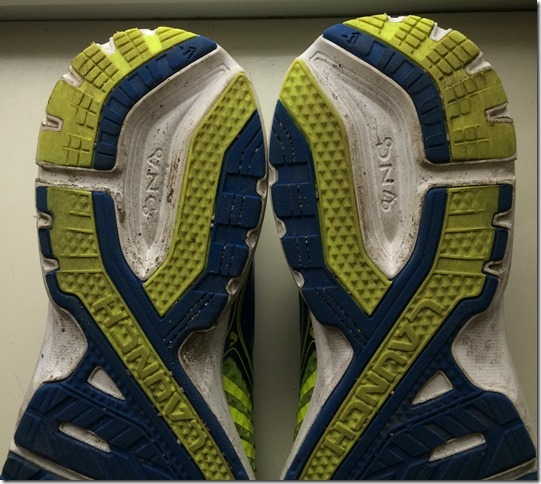 Right shoe upper, on the inner side, is pushed slightly deeper into the sole than on the left shoe The difference is actually felt during longer runs. It’s as if I had a small stone by mid the inner edge of the right shoe. The difference is also visually noticeable from outside by comparing stitch lines. Hi Peter, I am desperately looking for a review of the Brooks Defyance 7 and can’t seem to find them anywhere. Any chance you might review a pair soon? These shoes were chosen for me by an in store podiatrist for my over-pronating feet. I have small heels and wide feet. This is my first pair which I bought for my first run. The podiatrist tried three different pairs on me after a quick run on a pad which detected pressure points between soles and floor, and asked me to walk up and down which each pair. He said that that sometimes it is best not to ‘correct’ over-pronating and felt that the ‘neutral’ Brooks Defyance 7 was the best at keeping my feet stable as I walk up and down the store floor. As I tried to understand this better I came across your blog and an article about over-pronating. Towards the end of my free consultation with the podiatrist he seemed to be unsure about Defyance and another pair which name I can’t remember. He said Defyance provide support through constructions of shoes and not through padding, while the other pair provide both. In any case, I kept wondering whether we had picked to right shoes for me and so any review of the Defyance 7 would be extremely helpful. I am a novice so I am a little nervous about everything! Thanks in advance! No current plans to review the Defyance as I tend toward more minimal models. My best advice is to try them at a store that will let you take them for a short run before purchasing, and that will take them back if they don’t work out for you. Overpronation is not strongly linked to a lot of injuries, though there are a few that might be related. I wouldn’t worry too much about it unless you develop problems. With new runners it often takes a bit of trial and error to find the right shoe – don’t be nervous, enjoy the process! 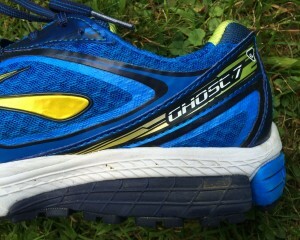 I’m on my second pair of Brooks Ghosts – I had the 6, now I’m wearing the 7 (women’s). The fit is too perfect for me – I have the highest arches known to man, a narrow heel, and wide forefoot. It is LITERALLY impossible to find a shoe to fit that. On my first pair, the outsole wore out in less than 200 miles, and on this pair, I’ve logged about 120 and am seeing a ton of wear in the same part (for me it’s in the big toe area – I’m pigeon toed). This is killing me, though, because I’ve been to my LRS and they recommended the Asics Gel Nimbus, which has a longer-lasting outsole, but no matter the lacing techniques, I was going numb in those by mile 2 of every run. I’m headed up to my LRS today to check out some other options – I’m in the last six weeks of marathon training, so I can’t afford to waste too much time on bad shoes. Anyone had any luck with the Glycerin, or do they wear out just as fast? My experience with the Ghost hasn’t been as happy. I wore through 3 pair of the Ghost 5 (10/D) — for me, the perfect shoe. The Ghost 7 is better, but still tight — pressure inward on the big toes. 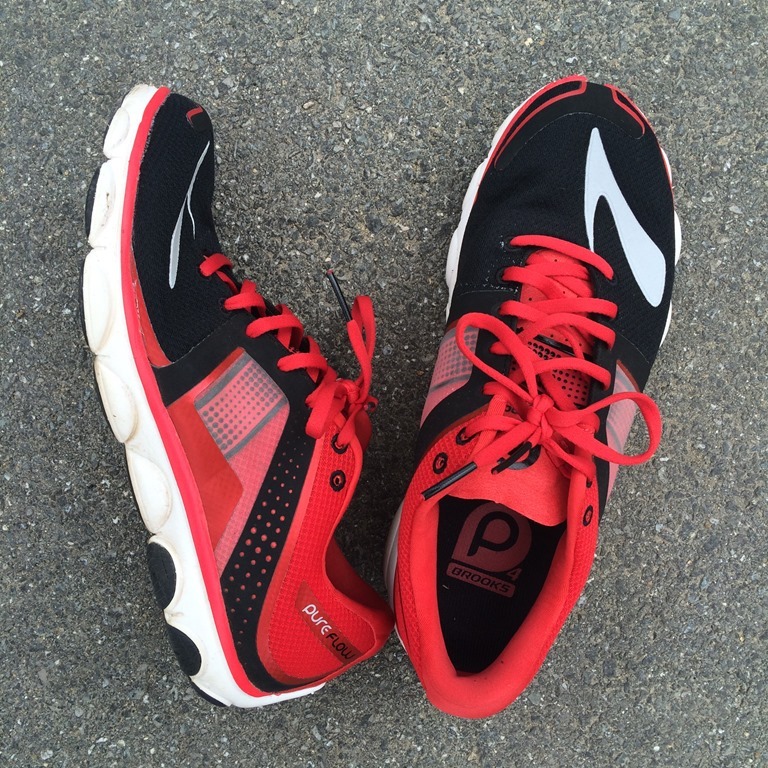 I’m now wearing Nimbus 15 (10/2e) – heavier, but they offer more cushion, and they FIT. One note on the Ghost 6 vs 7– I’ve been running in Ghosts for years. When my 6s ran out I got the 7 and at first it felt the same, but they’ve changed the position of the inside side “welds”. Causing a hella-blister on the side of my big toe. If your foot runs a little wide, beware. Erin – on your right big toe, specifically. How do I know? The Ghost 7 are manufactured flawed, all pairs I’ve ever seen. If you closely compare the seam lines on inner sides of both shoes, you’ll see an asymmetry. The blister takes a few miles to develop, the shoes are OK for short runs, at least for me. Holy crap. Based on your message, I just measured the distance from the toe cap to the seam on the inside edge. There’s a half-centimeter difference between the seam placement on R and L. That’s a huge variance. Thanks for that hint, now I’m going to contact Brooks and see if they’ll refund I’ve been kicking myself b/c I kept trying to make it work because just like you said– wasn’t bad on short runs. I figured I just needed a new callous. Ended up going past the period that my LRS allows for returns, so it was like throwing $100 out the window.